The green frog - Phyllomedusa bicolor, called a Kambô frog, is the largest species of the genus of the family Hylidae, found in southern Amazon and throughout the territory of Acre, also being found in almost all the Amazon countries, as the Guyana, Venezuela, Colombia, Peru and Bolivia. By extension, Kambô is also the name of this frog resin Kambô frog and its medical application: "We will take Kambô." But to the native, the main cause for taking Kambô is to fight 'panema'. ‘panema’ means sadness, lack of luck, irritation: ‘bad aura’ - as someone once well translated. The person is with "panema" when nothing goes right and nothing is good. The basic purpose of Kambô is ‘taking off the panema’ in order to go hunting and to attract women. And that, however difficult it is to the Western thought to accept, is the main purpose of Kambô: it establishes a spiritual 'management chock' in the life of people, a ‘chakra realignment’, a mark for organic and psychological reorganization, from which the person changes attitude and change their future patterns of health. Out of the 53 Brazilian indigenous groups that used to take the vaccine, today there are only 13. Three of them are big, with reserves in the region of Alto Jurua: The Kaxinawás, the Ashaninkas and Katukinas. There are variations in the rituals and names given to the green frog. The Katukina, however, has more affinity with the Kambô, taking his poison more often than other ethnic groups and have their identity bonded directly by the practice. The floral therapist and acupuncturist, Sonia Maria Valencia Menezes is a great deal responsible for the dissemination of the Katukina procedures with Kambô, maintaining an office in Sao Paulo together with the tribe - to administer applications - and promoting treatment travels to the Indian reserve in Alto Juruá. A few years ago, a caboclo use of Kambô arrived, rubber latex extractors from Acre learned this science with the Indians and began to implement Kambô in white people, in the cities of Cruzeiro do Sul and Rio Branco. Their headman was Francisco Gomes (or Shiban) from Cruzeiro do Sul, which lived together with the Indians for years and learned the art of Kambô. Genildo Gomes, son of Francisco Gomes, continued his work of distributing Kambô and created, in 2002, the Juruá´s Association for Extractivist Resources and Alternative Medicine, AJUREMA, main irradiation center for Kambô. 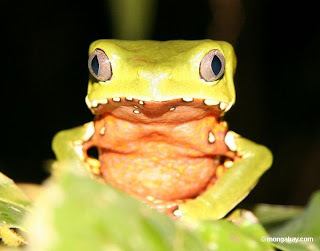 Although it is difficult to find (they get mixed with the leaves), the Kambô frogs can eventually be found near the igarapés, when they sing announcing the rain. The Indians generally do the 'harvest' at dawn, also singing. In some traditions, only the shaman 'crops' the frog and in others they all hear its call at night. The frogs are extremely poisonous and do not react when captured. Not even move, as if not having predators. Apparently, they are hard to swallow - the snakes, specimens almost always blind, oriented by the heat of prey, spit them out, desperately, when they bite them. The technique for extracting the poison is as old as it is simple. They tie the animal on its feet, shaping an "X" and spit him up three to four times, to irritate it. Secretion released, you need only to scratch it with a piece of wood. The secretion (seems foam) crystallizes up quickly and can be used at any time. There is no secret in Kambô application: with a piece of ember vine, one burns the arm several times, opening small holes in the skin (called points). The application of the resin diluted in water is carried over the skin and moves quickly to the entire body by the lymphatic vessels. The amount of points (usually in odd number) through which the poison will be introduced (with a wood spatula), depends on physical stature, the number of times that has already used Kambô, the reason for the application and assessment of the applicator, based on their knowledge. There are different philosophies between applicators, particularly among katukina and caboclo´s that use it in cities. For caboclos, there are counter-indications for pregnant women, nursing mothers or menstruating ladies, once it can cause hemorrhage due to dilation of blood vessels, as well as children less than ten years and older people with heart problems and high pressure. For Katukina, there is no such restriction and children begin to take Kambô from the age two, just after the period of breastfeeding. The Katukina take up to 100 points in a single application and apply at different times of the year, Throughout their whole life. In the caboclo use, the basic treatment is three doses, at intervals of time that depend on the development level of the person with Kambô. The first treatment is three months, are three increasing doses (e.g. 5, 7 and 9 points), within 28 days, preferably of the new moons and last quarter. Then, after at least six months from the last application of the first treatment, you can make one second, now every 15 days, with minor increasing doses(for example: 3, 5 and 7). They also make treatments for 7 days (at any moon other than the full moon) and for 3 days, combined with dietary changes (no solids or salt) and the use of Ayahuasca. The important thing is that the maximum interval between the two applications is a moon, 28 days. "If it takes more time than that between a dose and another, the Kambô will have to work all it had worked before again." According to David de Paula Nunes, son of a rubber latex extractor and one the main Amazon therapists, there is no obligation in taking it for three consecutive times and warns: "The Kambô is a vaccine and as such should not be used regularly in low dosages so that the body does not get used to the substances and lose their effect". Men generally apply in the arms or the chest. Women implement the points on the leg. In the case of Katukina, in the front of the leg. The caboclos usually, for aesthetic reasons, apply in the side of leg. For the Indians, the mark of the points on the skin is a reason of pride and should not be hidden or put on the back of the body. Another interesting difference: both Katukina and caboclos require being on diet without solids or salt for at least 12 hours. But while the Indians ingest a large quantity (3 to 5 liters) of corn caiçuma during the night, before taking Kambô, the caboclos prescribe only 2 liters of pure water a few minutes before application. The reaction of the vaccine lasts five minutes. In that time, the heart fires off, the blood flows accelerated through the veins, blood pressure rises or falls a lot, the person gets dizzy or nauseous. Some people see all white, as if the world were covered by a diffuse fog, or fall on the floor estrenghtlessly. There are also many reports of feeling an electrical current through the skin itching the body. Many users swell, appearing to be similar to a frog. Then, suddenly, the body reacts to the sickness and put everything out. Strong vomit and diarrhea are the most common responses. Only then, little by little, the senses are back to normal. The person feels light, clean, willing, in a good mood. After 30 minutes of application, the person is fit for their normal activities. My personal experience indicates that water plays a key role in the whole process, not only its ingestion by the patient but also in the dilution of the poison. It seems that a higher number of points in very diluted solutions (homeopathic perspective) is more effective (and with less chance of overdosing) than applications with fewer points and more secretion. Water is still prescribed for showering after the effects diminishes, not only to be clean from the excesses caused by the sickness (sweat, vomiting, feces) but also, in the symbolic sense, as a complement of Kambô process of cure. The researchers Edilene Coffaci de Lima (UFPR) and Beatriz Caiuby Labate (UNICAMP) study the spread of Kambô in urban centre, examining, in particular, the discourse of these various applicators (Indians, rubber latex extractors, holistic therapists and doctors) have been preparing on the use of the frog’s secretion. To them, "words are commuting; sometimes lean to a spiritualist explanation, sometimes to a scientific or medical interpretation of the diseases". It goes from the universal panacea (the cure for all illness) to placebo (a cure through psychological induction). And often these oscillations hide some simplifications. The word 'panema', for example, is re-interpreted as 'depression' by urban therapists. Or yet a negative energy capable of generating a broad spectrum of diseases. Moreover, the researchers believe that the production and commercialization of substances take away from the Kambô´s application its most impressive effect. That medicine of science is inseparable from the medicine of the soul (LIMA & LABATE, 2007). International scientific research, on the pharmaceutical and chemical areas, are being made on the properties of Kambô since the 80´s. Italian, French and Israelis researchers already entered with a request for the patent of dermorfine application. More recently, the University of Kentucky (USA) is searching (and patenting) deltorfine in collaboration with pharmaceutical company Zymogenetics. Several international laboratories are already interested in the venom of the Kambô to develop a drug that can lead to the cure of cancer. In 2003, some katukina of Cruzeiro do Sul sought the Board of Genetic Heritage Management (CGEN) to denounce the misuse of Kambô. Asked for a solution against the use of Kambô by urban people; they were concerned, too, about their intellectual rights in the case of drugs derived from the substance. It is worth to remember that a patent can take many years until come to eventually turn into a remedy. On April 29, 2004, the National Sanitary Surveillance Agency (ANVISA) prohibited any advertising of medicinal and therapeutic virtues of Kambô. The Minister Marina Silva decided to treat this as a model case. In order to do so, she appointed a working group of the Ministry of Environment for a joint action. The group, which has been gathering since 2004, brings together representatives of indigenous people, anthropologists, indigenists, herpetologists (biologists who study frogs), molecular biologists and physicians. But the Kambô is, as we have seen, a complex a slippery object, irreducible to the various scientific discourses (clinical, alternative, pharmacy-chemical, anthropological and so on) and will hardly be regulated or reduced without first redefining the prospects in which it is described up to the moment. When one talks about Kambô and its definition, some are concerned about the forest management of the frog, other chemical patents, others with therapeutic possibilities of its application, but for the Indians, the explanation is much simpler: the Kambô is the spirit of Pajé Kampu accomplishing its mission to protect the health of forest defenders .